ESTERO, Fla. - Merrick Madsen stopped all 32 shots he faced, and Matt McMorrow tallied the lone goal, as the Norfolk Admirals spoiled the home opener for the Florida Everblades with 1-0 win on Friday night at Hertz Arena. Despite a 32-24 edge in shots on goal and multiple quality scoring chances, the 'Blades (1-2-0-0, 2 PTS) couldn't find the back of the net against Madsen and the Admirals (2-0-0-0, 4 PTS). "We hit five posts tonight. We certainly had our opportunities," Florida head coach Brad Ralph said. "A quarter of an inch the other way, those pucks are in the net, and we're probably talking a different story. "I was happy with the effort that our guys put forth," Ralph added. "It just feels pretty rare that you're able to have that many scoring chances and the quality of scoring chances that we did and not score a goal." On one of the near misses of the game, the Everblades appeared to score the first goal on a rocket of a shot by John McCarron during the 'Blades first power play of the night. Steven Lorentz sent a pass through the slot that McCarron teed off on from the left circle, but the puck went bar down and bounced out. The Admirals then struck for the only goal of the contest at 11:42 of the first period. After establishing a zone presence in the Blades end, Ben Duffy sent a pass from behind the net to Matt McMorrow in the slot, and McMorrow one-timed it through the five-hole of Florida goaltender Jeremy Helvig to make it a 1-0 game. Still trailing 1-0 at the outset of the third period, Florida turned up the pressure and fired 14 shots in the final stanza. "We were hard on it. We were playing emotional. The guys were driven," Ralph said of Florida's play in the third. "As much traffic as we got, I thought there were some rebounds that just bounced over our stick." One of Florida's best opportunities to tie the game came around the midway point of the period when the Everblades received a 4-on-3 power play. Derek Sheppard found space in the offensive zone and unloaded a shot, but it was another puck that hit a post. The Blades pulled Helvig for the extra attacker with a little over two minutes to play and continued to pepper Norfolk with shots. But Madsen stood strong to earn his first career shutout. Helvig finished with 23 saves in his home debut for Florida. 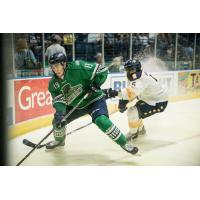 The Everblades will go for the series split with the Admirals on Saturday night. "This group continues to understand the emotional level that you've got to compete with on a game-by-game basis, so I think we'll be able to build off that," Ralph said. "We'll have a burr under our saddle that we let this game slip away from us." Individual game tickets for all regular season games are on sale now! Ticket packages for the 2018-19 season are on sale now! Become part of the Everblades Family with a Full Season, Partial Season or a Flexible Voucher Package that fits your schedule and budget! All Ticket & Voucher Packages provide savings and special benefits! Ask about the payment plan options too!